Ok, I had to share these with you guys...any of you that have children, they don't even have to be of the teething age...you have to make these! Why, you ask? Well, because I said so, obviously! Ha! No, really, they aren't the best tasting cookie, rather bland I think. But both my kids love them!! Gray calls them cookies and I totally don't mind him asking for these because they have either fruit or veggies in and NO SUGAR!! And since tomorrow is Valentine's Day, I got a little festive and we cut them into hearts! Makes about a dozen, depending on how big of shapes you use. Preheat oven to 425ºF / 220ºC. In a bowl, mix together flour, cereal and cinnamon. Probably another reason why Gray loves them is because he helped make them. Add in oil, banana and water. 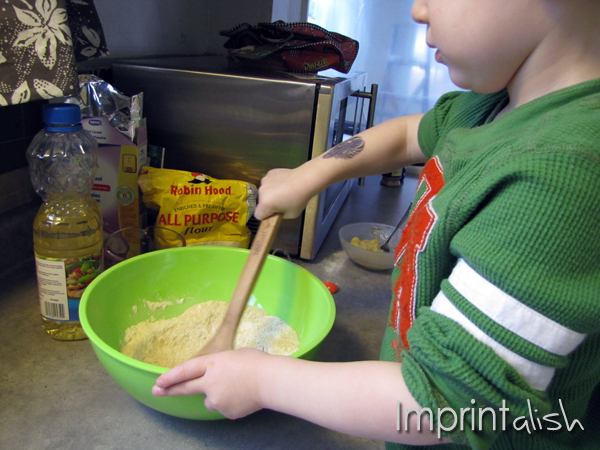 Mix until dough comes together to form a firm, non-sticky dough. 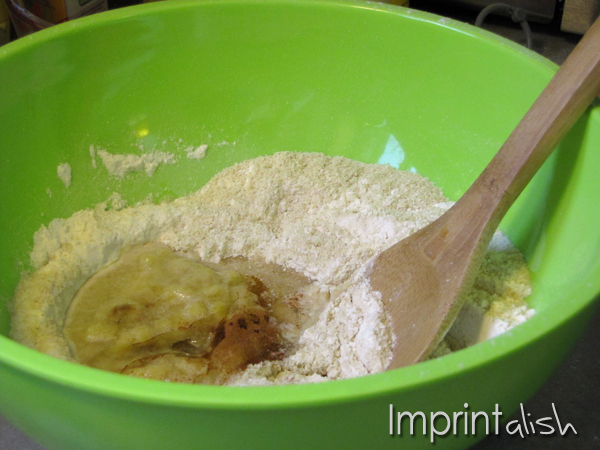 Add water or flour (1 tablespoon at a time) if necessary. 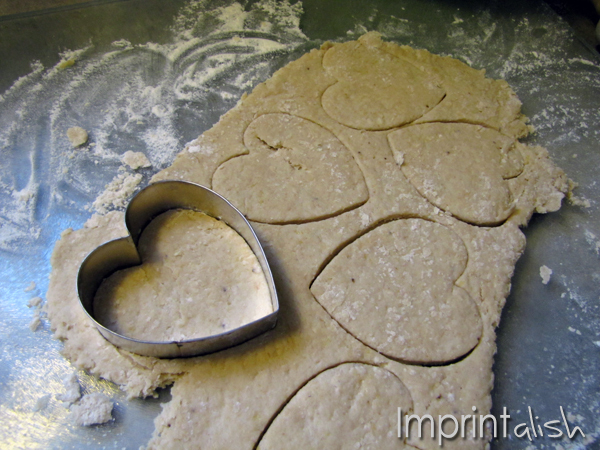 On a lightly floured surface, roll the dough out about 1/2 inch thick and cut into shapes or bars. Bake on a greased cookie sheet for 10-12 minutes, or until slightly brown. Allow to cool completely and store in an airtight container. Enjoy! OMGoodnes. What an adorable little helpee ya got there mama! This is the best idea. OoooLaLa... that giveaway sounds lovely! Thank you for this! I have an infant who will be needing these in the future. I would love for you to come by and link up to my Recipe Party at The Sweet Spot! What an awesome idea. Thanks for sharing! I'll have a teething infant at some point this year and would much rather make these than buy the ones from the store! I'm going to have to try these! My little one is cutting his molars right now! My wife also made teething biscuits for our son back then. He loved it and even asked for more after the teething stage was over. I'll definitely share your recipe to my wife. Saw these babys on Pinterest! My 10 month is teething sooo bad right now. This sounds perfect for her!! Thanks!! I just made these, and they're in the oven right now! I used baby oatmeal and mashed sweet potatoes... I can't wait to see how they turned out! I was wondering how old your babies were when you started to give them these. great idea! @ Kristen-My youngest was 6 months old when he first had these, took him awhile to naw away at it and both my boys still eat them (3 years and 1 year)! How'd the oatmeal turn out? I've been curious if it'd work the same with oatmeal as it does with rice. Could applesauce be used in place of the bananas?? @ Kim-Absolutely!!!! I've substituted apple sauce and it turns out a bit more moist, but still good ! I was thinking about using butternut squash. Any ideas on how that would turn out? i just made these and i was curious are they supposed to be crunchy or more chewy? mine turned out sort of "gummy". not sure if i added too much water (i added 1 TBSP extra, to get it mixed up). I just made 2 batches! In one I used whole wheat cereal and sweet potatoes & the second had mixed grain cereal with carrots, my 8 month old LOVES both! My daughter is teething but doesnt have any actual teeth yet? Would these be safe for her or does she need teeth first? Also can baby food bananas work in place of an actual banana? YAY! So glad they enjoyed them! Oh and baby food banana would probably work, just be a bit moister, maybe? Fabulous, that is so good to hear!!!! Thanks for trying them! @yungteach951- I have no idea how well the dough would freeze...you need to try it and let me know though :D Good luck! I'm sure someone already asked this, but do they work pretty much the same with Oatmeal cereal? I made these for my kids this morning, and used applesauce. My five year old told me they "tasted pretty bad." and my 20 month old spit hers out and handed it to me. haha. I suppose thinking I could replace the cinnamon with a pinch of nutmeg may have done it. I think it's a great recipe though, and I'm not giving up!!!!! I'm 5 months pregnant, so this recipe will come in handy for the next one! Thanks for sharing such an awesome recipe! My kids never ate much rice cereal, so I would have unopened boxes leftover by the time they grew out of the rice cereal phase! love having an alternative to tossing it out. @ Molly-yep any type of cereal will work! @ Samul Family-oh no!! LOL...you could always experiment with different flavourings for sure! Good luck! Found this on Pinterest, Planning on making these right away! Is that a Pampered Chef bar pan you're cooking yours on? Mine are all cut out & ready for oven (had another project done first) my 8 month old wont touch baby cereal or baby food anymore so I had tropical mixed fruit & mixed cereal so I am trying those. I also used bread flour for more protein! Hoping they turn out. I got 1 dozen larger 1 dozen small & a few bars out of the dough! @ashley I kept mine for about a week and a half. But I don't see why they couldn't be frozen once baked...maybe a couple months? Doesn't hurt to try :) I know I have some cereal left over too that I need to use up too!!! @busybee_jrs-HAHA! Love that your dog approves :)and your kiddos too! I was wondering if i could use gluten free pancake mix instead of regular flour? Anybody tried that yet? I just made them and can't wait to take over to grandbaby. Smells so good. I have got to make these for my granddaughter! We have so much cereal that will never get eaten. She will love these!! I found them on Pinterest & will be repinning them! I was wondering if I could use olive oil instead of vegetable oil? I have to say that I LOVE LOVE LOVE this recipe! I made them for my boys and they are great! My 6 month old loves to gnaw on them for his teething and my 2 1/2 year old loves to eat them (which I'm great with since there's no sugar!). Loe them! tried them for my daughter. Altered the recipe a bit. 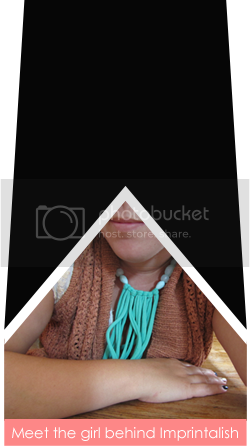 I'm linking this page to my blog. I made these today for my 11 month old who is teething horribly!! He loved them and it really seemed to help him with his pain!! 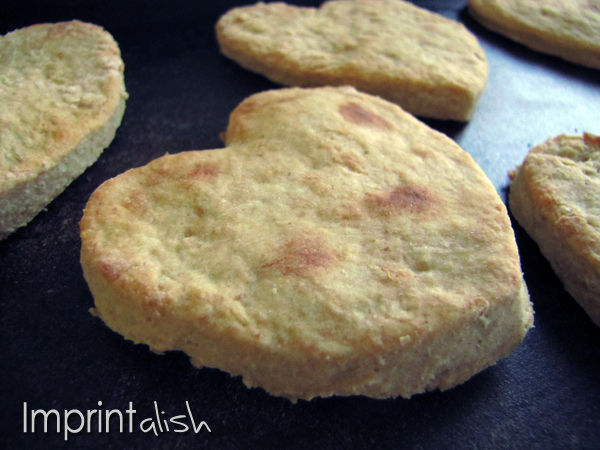 My daughter (2) wasnt too fond of them, my guess is because they are a little bland, but perfect for my little guy!! I will definitely be making them again!! Thanks for the great recipe. Lish, Wonderful cookies for my grand daughter. Thank you for sharing. I love this idea! I have twins that are turning 1 this month and have completely stopped eating any "baby" food. I have multiple boxes of baby cereal left and I'm looking forward to putting it to use, especially now that snack time is such a big deal to them! Thanks! Love love love thank you so much. Made this up for my baby boy and liked it. Linked this page on my blog. I am making these right now. 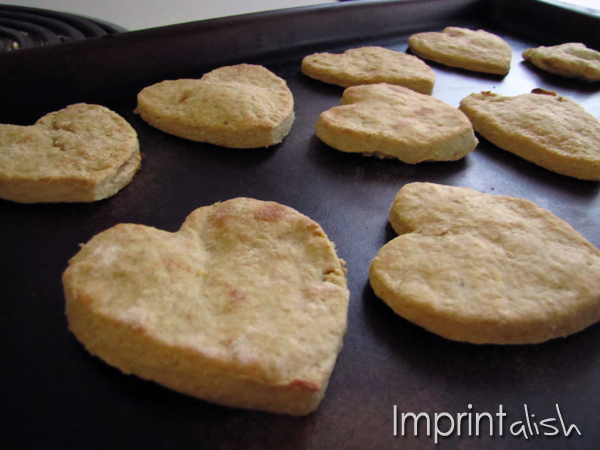 I used multigrain cereal and whole wheat flour and sweet potatos...i hope she likes them! Seems like a healthy nutritous snack! I made these with carrot- my boy seemed to really enjoy them. Made some into twists and others like snowflakes. I learned the hard way not to add extra water fast! Thanks for the recipe. @Tara-what a great idea to twist them!! Glad they went over well!! HEY!! new blogger here www.reereesplace.com I'll be sharing your recipe on my blog this week! I love these! i'm wondering, did you have a recipe to make them more crispy like? i'm thinking I sawa biscotti like recipe! Was that from you? Thank you so much for sharing!! I put them back in the oven the next day for 30 min at 300°. Honestly even the flavor improves after drying them out. I think cooking them more like biscotti next time might be worth trying. My son loves theses but i used whole wheat flour and they came out great !!! I made these yesterday for my 8 mo old grandson and he loves them! He only has 3 teeth coming in, but he had fun gnawing one! I just made these today, except I substituted pureed peaches instead of bananas, and my seven month old LOVED them! Thanks for the recipe! These have been a BIG hit with my little guy! Thanks for sharing this recipe. Today I was looking for some homemade cheerio ideas and most of the recipes had similar ingredients to this one except they had sugar. So I decided to try making my own with your teething biscuits, I made pea sized bites and baked for about 4 minutes and they turned our great! They came out more like baby puffs than cheerios but My son LOVED them and like the biscuits they are super easy to make! Thanks again! I just made these for my daughter and she LOVES them! My only problem is that they break into chunks when she gnaws on them after a bit... Am I doing something wrong? She doesn't have teeth. @Heather jean-what a great idea! @Amanda C-Mmm...I can't say that either one of my sons ever had chunks come off, maybe it was too dry? Although as she gnaws on them it should dissolve? @Rachel P-That's awesome that your husband eats them too!!! LOL! Can I use rice flour instead of regular? My kid is allergic and I'm trying to find some good allergy free foods/snacks for him. @Jessica rowell...I don't see why you wouldn't be able too, I'm not that familiar with rice flour...it might just change the consistency? Well I absolutely loved this idea and with my 8 month old son not liking the plastic teethers, this sounded perfect. Better idea than the store bought ones. So I'm making them now and am super excited about giving them to my son! I just made these. But my dough was really flakey and wouldn't really stick together for me to roll out. I added more water so that it would. Maybe my banana was too small...do you think you could add a picture of what the dough consistency should look like? Thanks for the recipe! Just made these for my 6 month old, who already has 5 teeth! The dough was a little flaky and wouldnt stick together, so I added more water. Cant wait for him to test them out once they cool! I just wanted to thank you for this post. My little toddler is almost two and these have been a snack staple in our house since she was about 9 months. I have made them in many varieties with carrots, applesauce, banana, squash, and sweet potato. I have used every kind of infant cereal, how else would I use that stuff? I have used every kind of flour you can think of, rice, almond, whole wheat, flax, coconut. And I have used different oil varieties as well, olive, coconut, and canola. And they always turn out about the same, my little one gobbles them up. I make a big batch and freeze them, then I just grab a few out of the freezer when needed. These make great snacks in the car or out and about and I feel so much better giving these to my little one instead of some highly processed granola bar or crackers. Thanks so much! Mine didn't come out quite right. I think I added too much water. I Sub bananas for sweet potatoes with extra cinnamon and my daughter loved them! They came out more like a soft cookie. I will try again when she chows through these :) Awesome alternative to store bought biscuits and even gold fish and puffs. Love it! Thank you!!! I make my own baby cereals by grinding up whole grain rice or oats, and cooking them. Commercially prepared baby cereal has already been cooked, and then dehydrated. So would it be ok to substitute 1 cup of my own (cooked) baby cereal for the 1 cup of baby cereal powder, even though my own version wouldn't be in powder format? Or should I adjust the amount to be more (or less)? I made these (bunny-shaped, of course!) on Sunday and my little one loves them! She is 9 months and teething. I can't get her to eat any purées or finger foods, but she will eat these. Thank God!